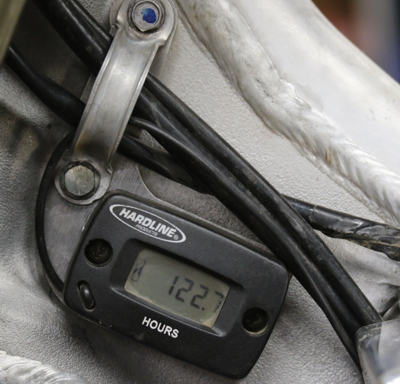 In this inaugural issue of Inside Line we explore the time and money needed to bring a typical used bike up to race ready standards. In future issues we will dive deeper into the various repairs needed along with some performance modifications to make it even better. "Fresh top end, needs nothing." If you expect it to be well maintained and problem free, get used to disappointment. While you may be able to avoid this problem if you are willing to pay top dollar for a bike with detailed maintenance records, finding a bike like that is difficult to say the least. If you really want like new you should probably buy new. We will be exploring the cost/benefit of this possibility in a future edition. 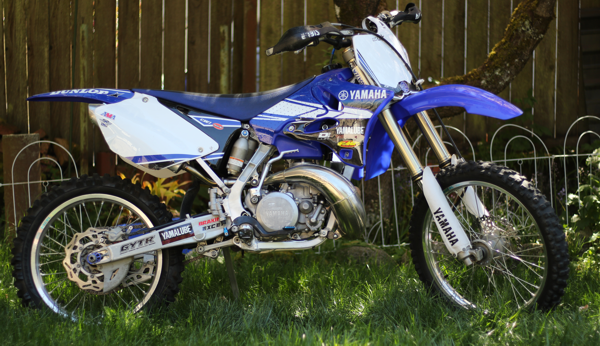 In this case the previous owner (PO) made no such claims so we had a pretty good idea of what we were getting: a well-used (122.7hr), off-road ridden, clean looking 2013 YZ250 with some good after-market parts that was going to need all the usual repairs. Since we got this bike at a reasonable price and the owner was very forthcoming (after the money had changed hands) about the lack of maintenance we had a pretty good idea what we were getting. With that in mind we set about tearing down this bike to deal with the predictable maintenance issues (chassis bearings, tired top end, unserviced suspension), known issues (leaking fork seals, worn chain, sprockets, and tires) and to look for and repair any other hidden problems. Leaking fork seals are almost a given on any used bike. Since the steering bearings felt "lumpy" when the handlebars were turned it was obvious it needed those, and by extension, it was probably going to need all the suspension bearings as well. Its easy to see why the steering felt "lumpy". Experience says that if the steering bearings are bad every other chassis bearing is also; and once again, experience was correct! This is what happens if you don't service your suspension. Outside of the anticipated issues there was surprisingly little wrong with this bike, but still it wasn't without its surprises. 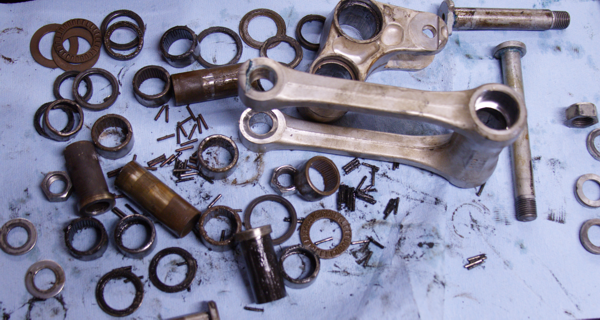 The first one of those was encountered when disassembling the forks to replace the leaking fork seals. That came in the form of a failed free piston. This is apparently a known issue with the KYB SSS fork. 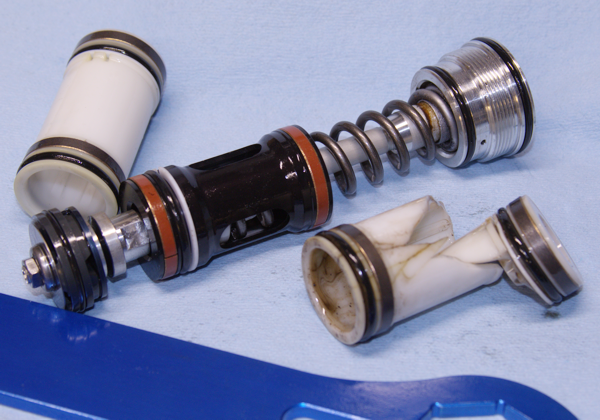 When the internal seals become worn and begin to leak the pressure in the free piston can increase to the point that it fails structurally. 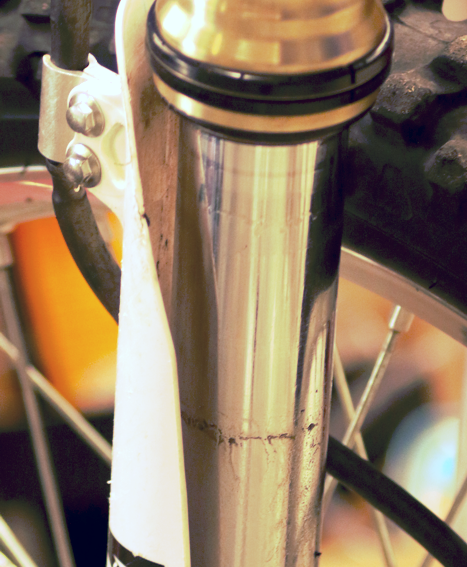 This is apparently a not uncommon problem with the SSS fork. Fortunately there are after-market replacements available. The up side of this being a common issue is you have options. According to the parts diagram only sells that as a component of the base valve. While there are sources for the original plastic version we opted for one of the after-market aluminum ones which are open on the sides and will not rupture if the seals leak. The second major surprise was the piston. With 122+ hours on it we certainly expected it would need replaced, but clearly this bike had been running lean (air/fuel ratio not fuel/oil) for an extended period. 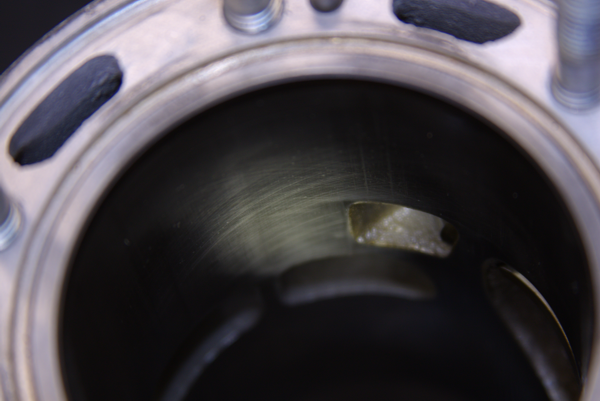 As you can see from the picture there was significant erosion of the piston crown, in particular where it faces the exhaust port. This was run lean for a very long time. 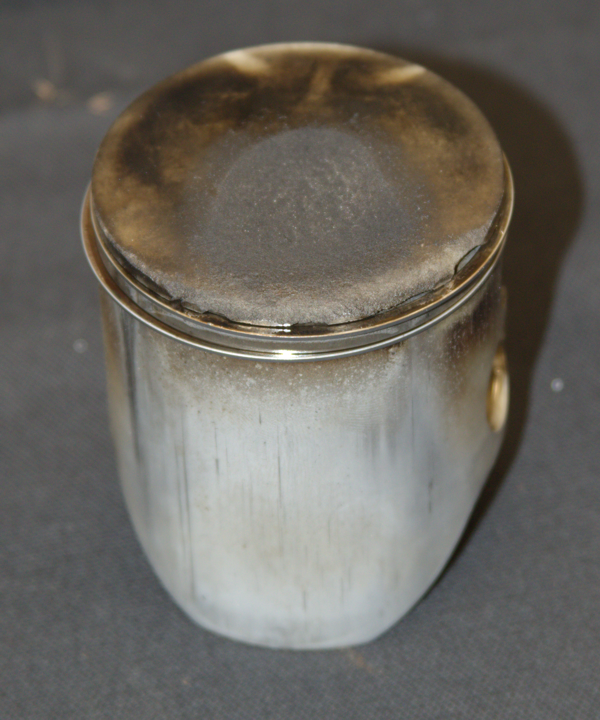 Judging by the pattern of damage this was primarily due to excessive combustion temperatures more than heavy detonation since the damage was confined to the piston crown as you can see from this picture of the head and cylinder. Modern coatings are pretty amazing. Given the number of hours on this engine you would expect some wear but you can still see the hone marks in the cylinder wall and there are no signs of significant wear. Bellow the piston everything still looked new. 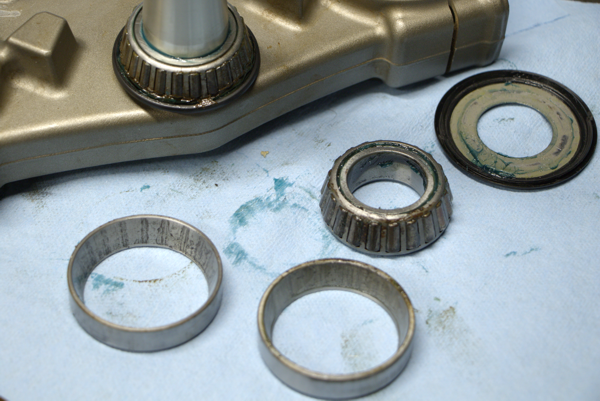 The large and small end rod bearings have no visible wear, the crank is still in spec and smooth. A fresh piston, rings, clips, small end bearing and pin and, of course, gaskets along with the mandatory leak test and the motor is ready to go back into the frame that is now freshened up with new bearings, seals and chain buffers and freshly serviced shock. 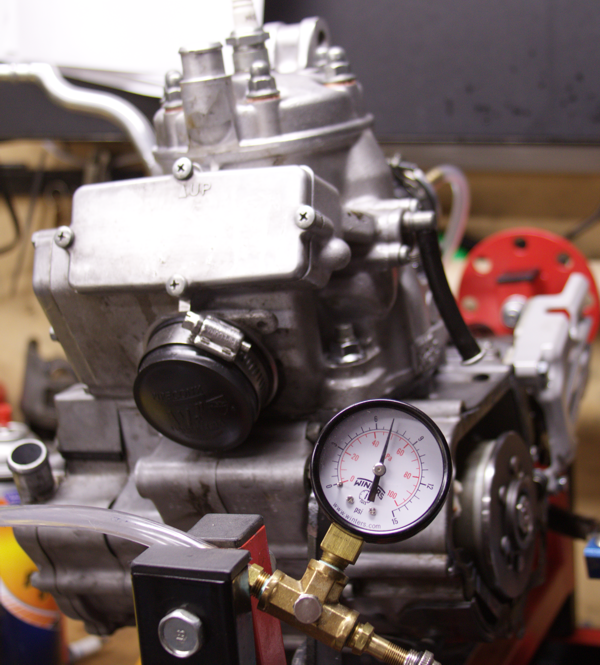 Leak testing the engine before putting it back in the frame. If you need a leak tester of your own, here is how to build one. One other unexpected surprise was that while the bike had new brake pads front and rear it was missing all the insulating shims. The PO must have thought that since they didn't come with the new pads (as they don't) that they were somehow part of the original set that weren't necessary. They are necessary as they help to keep the brake fluid from boiling so those went onto the parts list as well. The only other issues were mismatched and worn tires, worn brake pins, some mismatched bolts, a stripped lower motor mount bolt, an incorrect exhaust pipe hanger and a torn seat cover. All pretty typical for a used bike of this age. The purchase price for this bike was $3800. For our neck of the woods this is fair price. All in we invested another approximately $1300 to make it mechanically sound along with about 10 hours of labor. We choose not to "zero time" this bike, to borrow a concept from aviation, and inspect and replace all the moving pieces (transmission bearings, crank and main bearings, wheel bearings, transmission, etc.) to make it truly like new again as that would have been both unnecessary mechanically and unnecessarily costly. In the end we have a mechanically sound, race ready 2013 YZ250 complete with some nice after-market components that add another $1000 in value for about $2300 below the cost of a new (and save plastic, unchanged) version. Had we not had the tools and know-how to do this work ourselves it would of course have been more expensive, potentially much more expensive. You should carefully consider your ability and willingness to work on a bike before you hand over your hard earned money. Questions, comments, criticism? Join the discussion in the forum.